For years, teachers have used worksheets to provide practice in basic facts. This practice has not produced the desired outcome for many students so consider a different approach. Use games regularly in the classroom to provide targeted basic facts practice and to differentiate practice to best meet the varied needs of students in the classroom. Students enjoy these math games and forget they are "doing math." Students who have fact power are the most successful in winning these games, so there's a natural motivation to learn the facts and increase the odds of winning. Check out the Mathwire Games Collection for new games to add to your classroom collection. Contig is a very effective game that encourages students to master basic facts (+ - x /) in order to get the most points with each play. Contig Jr. is designed to provide that same format for younger students who need to develop mastery of addition and subtraction facts. 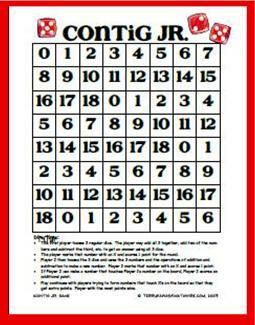 Download the directions and game board for Contig Jr.
How to play Contig Jr.: Player 1 tosses 3 dice. He/she then uses those 3 numbers and the operations of addition and subtraction to make an answer that is on the game board. For example, if the player threw 3, 5 and 2, the player could form these numbers. The player may mark an X on any one of these numbers (10, 6, 0 or 4) anywhere on the board. He/she gets a point for being able to make an X on the game board. If his/her X touches other X's around it, the player gets an additional point for each X it touches (even at corners). Players learn to select the number that touches the most other X's to get the most points. With more experience, players learn to try out all of the different possible combinations, as listed above, in search of the number that will give them the most points. When players reach this stage, it is optimal play for the development of "fact power" as they mentally rehearse lots of different combinations in search of the perfect move. 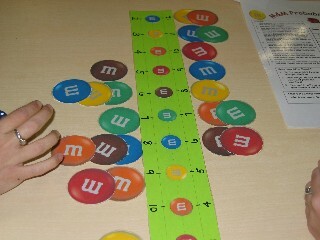 In the M&M Probability Game, students place M&M markers on the numbers 2-12. 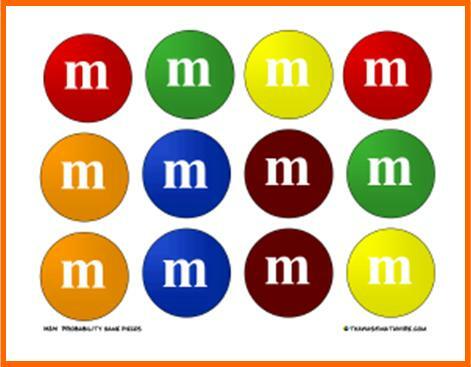 Students may place one M&M marker on each number or place several on some numbers and leave other numbers blank. Next, students toss two 6-sided dice, find the sum, and remove an M&M marker from that number, if there is still one. The first player to remove all markers wins the game. The game, designed by Susie Siegel, a New Jersey teacher, includes PDF files for the directions,and a recording sheet. In response to several requests, Terry Kawas has created M&M game pieces that may be printed, cut apart, and used with sentence strips, as pictured above. Some teachers opt to use round foam pieces, available at craft stores, as alternative game pieces. 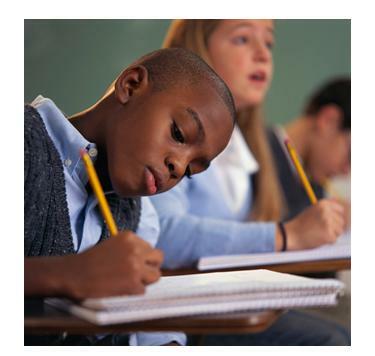 Writing in Mathematics discusses easy strategies to get students talking and writing math. Writing is used to help students reflect on their learning, deepen their understanding of important concepts by explaining and providing examples of those concepts, and make important connections to real-life applications of the math they are learning. Teachers use the writing assignments to assess student understanding of important concepts, student proficiency in explaining and using those concepts and each student's attitude toward learning mathematics. Math Out Loud contends that talking one's way through a problem, listening to others' solutions, and writing about the steps one took to solve the problem can help students to organize and consolidate their math thinking. This Scholastic article details procedures for developing math communication skills. Be sure to bookmark 59 Writing Prompts for Math Teachers for future reference as you'll return often for inspiration as you develop your own list of effective writing prompts. Using Writing in Mathematics discusses step-by-step procedures for introducing students to writing in math class and using writing to deepen student understanding of important mathematical concepts. In Math and Communication, Kay Tolliver shares effective strategies that encourage students to speak and write math. In Adapting Literacy Strategies to Improve Student Performance on Constructed-Response Items , Anne Mikesell discusses O'Connell and Croskey's three-part scaffolding process for supporting students in writing about mathematics: write-aloud, write along, write alone. Students need lots of practice to learn and master basic facts. Games are a fun way to provide regular practice and they can be easily differentiated to accommodate the varied needs of students in a class. The Three Strikes And You're Out! 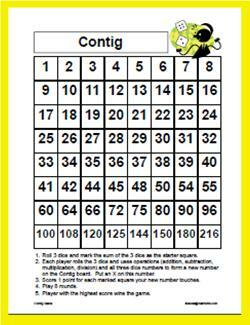 game is designed to practice addition or subtraction facts. The game uses the sum of two dice to practice addition facts, but may easily be adapted to practice subtraction facts by using two 12-sided dice and finding the difference. 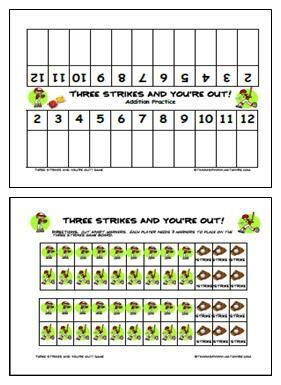 The game handouts include directions, variations in play and scoring, game boards for both the addition and subtraction games, as well as game pieces that may be used to support the baseball theme. Face Off: This game also uses the sum of 2 regular dice to practice addition facts, using a clown-circus theme. View and download the Face Off Game and Directions. Free the Animals: This game uses the difference of 2 regular dice or the difference of two 12-sided dice to practice subtraction facts. View and download the Free the Animals Game and Directions.